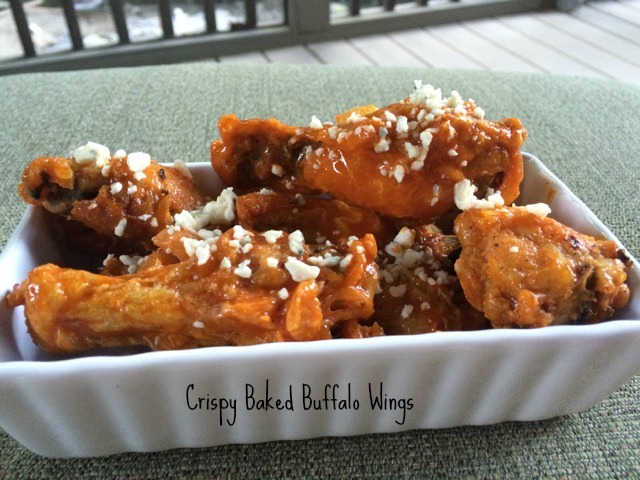 These crispy baked buffalo wings have the same crispy crunchy skin as deep fried but are BAKED! My family declared these the best wings EVER! My youngest daughter and I are obsessed with buffalo wings. We’ve eaten them at most every place in town, but I’ve never tried making them at home. I’ve always thought that deep frying was necessary to achieve the crispy-crunchy texture that makes wings so yummy. I’ve used fresh and frozen wings, and both turned out equally yummy. If using frozen, it is important to rinse the wings to remove the ice glaze before coating and baking them. The wings turned out to be INCREDIBLE! My family couldn’t stop raving. We all agreed that these are as good or better than most wings you’ll find at any restaurant. Even better, they are not deep fried in oil. The wings actually “fry” in their own skins, which have plenty of fat to do the job. I am so happy to have discovered this recipe. Wings are the perfect party food for teens, and making them at home saves tons of money. I’d love to hear from you if you try this. Always feel free to leave comments or get in touch via email. Thanks so much for stopping by! Be blessed, and stay savvy!!! Oven baked wings that have the crispiest skin ever. No one will ever know they weren't fried! Put one oven shelf in the lower quarter of the oven and one in the top quarter. Place the wings in a large ziplock bag. Add the baking powder and salt; shake the bag to coat the wings evenly. Line the tray with foil. Spray the rack on the baking tray with oil. Place the wings skin side up on the rack. Bake on the lower shelf in the oven for 30 minutes. Then move the tray up to the higher shelf and turn the oven up to 425F. Bake for a further 40 to 50 minutes~no need to turn wings during cooking. The wings are ready when they are dark golden brown and the skin is very crispy. Toss with Hot Sauce and serve immediately with Blue Cheese Dip and celery sticks. They can be served plain, with a dipping sauce or tossed in sauce.